Rebel is just 18 months old. He's a blue nose pit. 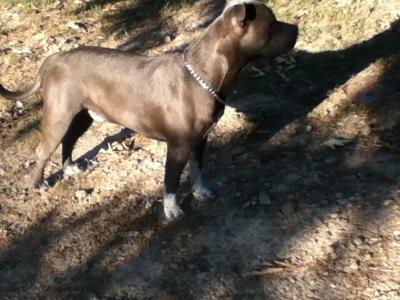 He's 100 pounds and his daddy King is from the ultimate blue nose clan weighing out at 135 pounds. Both are a whole lot of fun. He's got a brother named Yankee from a different litter same ma & pa. He's also a beautiful blue nose. But he is a champagne color. They are 12 months apart. They are best buds. Hopefully they stay like that. Yankee thinks the world of his brother. Rebel likes to chase the squirrels in the morning. He's fenced so he can't catch them. He loves people and riding in the truck. Likes to swim at the river and at the pool.